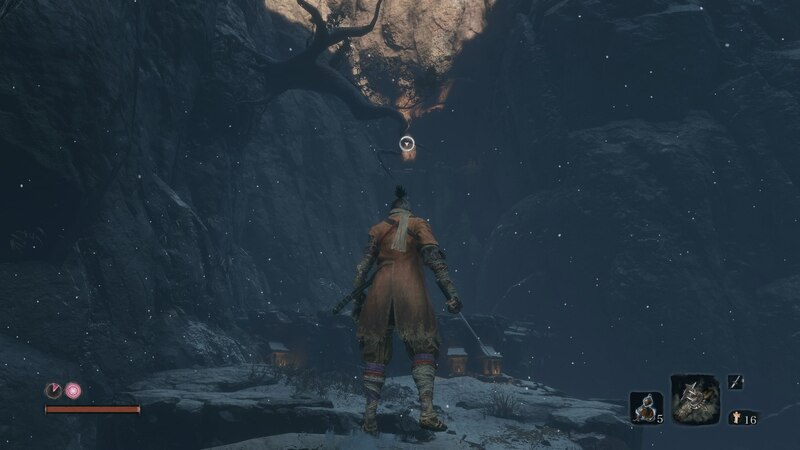 This is our guide on how to avoid the giant snake, the first time you encounter it in Sekiro: Shadows Die Twice. 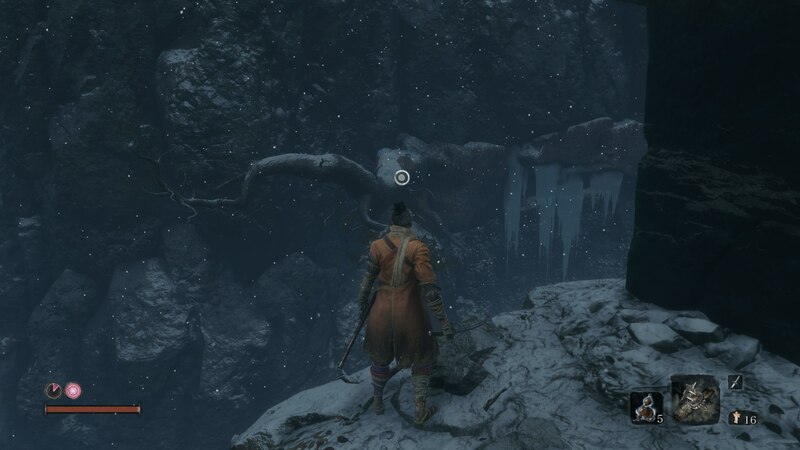 The giant snake is going to make the early goings of Sekiro: Shadows Die Twice particularly painful. 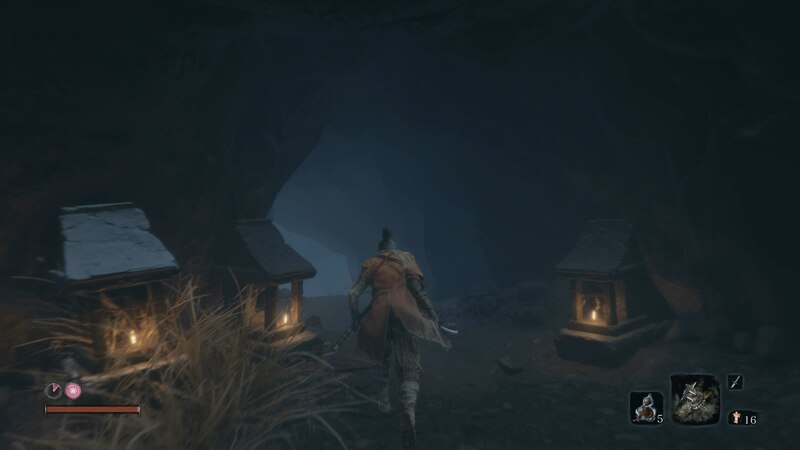 In our Sekiro giant snake walkthrough, we'll be guiding you through how you can safely make your way through the gorge near the Ashina Outskirts area of the game. You start off the section with the giant snake from the Underbridge Valley Sculptor's Idol. Here, if you look to your left when looking out over the gorge, you can see a few ledges that you can safely descend down. 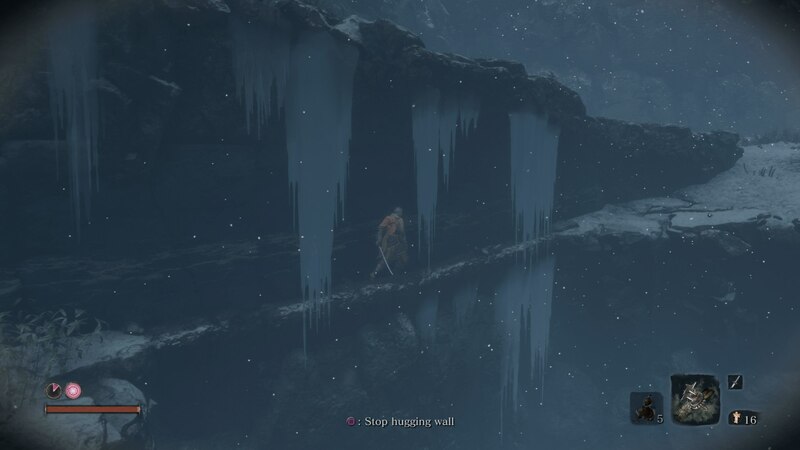 Wolf doesn't take fall damage in Sekiro, so don't worry about getting hurt. When you've descended down a few ledges, the giant snake will appear. When you hear a rumbling, look out over the gorge, and you'll see a tree branch that you're able to jump towards, and then grapple onto with the prosthetic arm. Now the giant snake will be in the middle of the gorge, and you need to time your next jump to the next tree branch perfectly. When the snake isn't looking in your general area, jump out into the gorge and grapple your way to safety. Immediately jump down to your right once you're on the tree branch, and then press the left analog stick to hide in the tall grass. 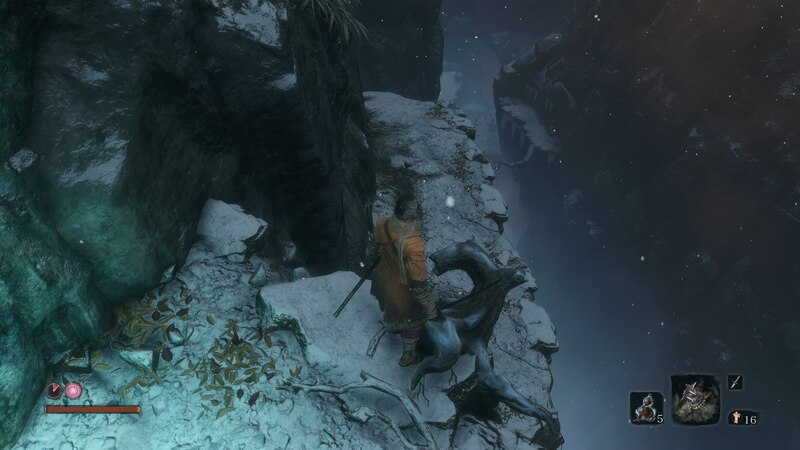 Again, when the snake isn't looking in your direction, jump across the gorge to the tree branch opposite you with the help of the Shinobi Prosthetic. You'll see a small tunnel ahead of you that you can go through, during which a scripted event will occur where the snake will see you, but can't reach you. At the other end of the tunnel, you need to move quickly. Drop down to the area ahead of you, then turn left. 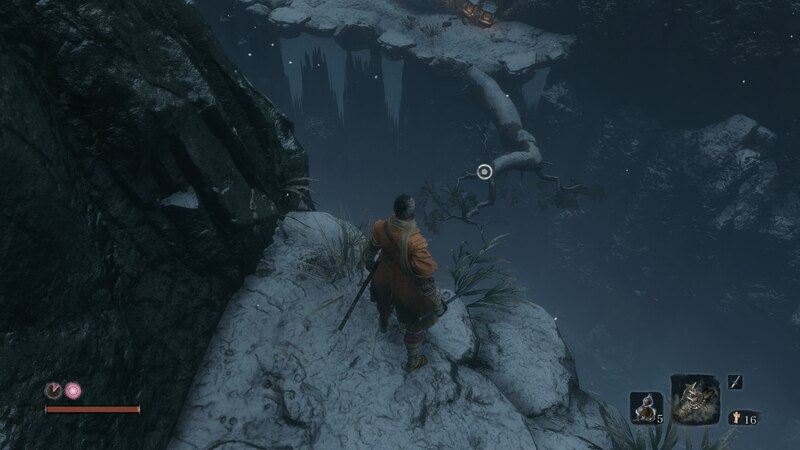 You can now jump over a gap, grabbing onto the ledge on the other side, and pulling yourself up quickly to hide in some tall grass, before the giant snake arrives in the area. In the tall grass, avoid the body of the giant snake as it writhes around, searching for you. When possible, you need to move to the next grassy area that's almost connected to the first one that you're hiding in. At the edge of this second tall grass area, you can hug a cliff wall, and skirt along underneath the giant snake. When the snake looks back towards the start of the area where you previously were, stop hugging the cliff wall, and make your way quickly towards the object in the area that looks like a very small house. 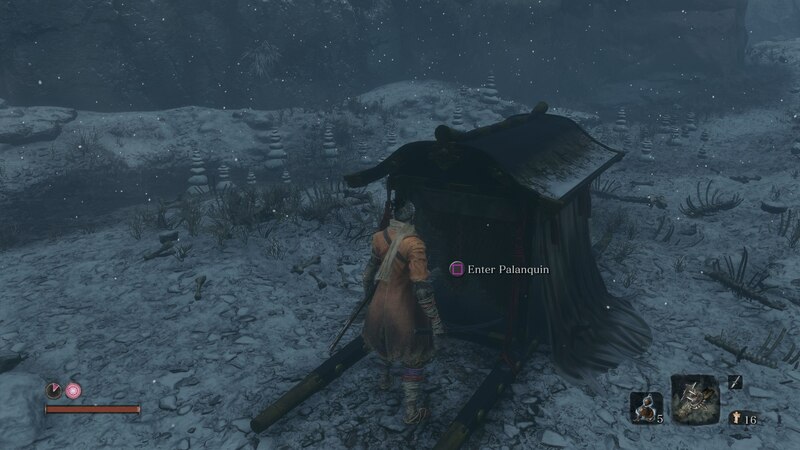 When you're standing next to this object, which is called a Palanquin, you'll get the option to enter it. Stay in the Palanquin, and the snake will draw perilously close to you. As the eye of the snake draws closer, you'll eventually get the Deathblow (red dot) prompt on the eye. Now press the right bumper to stab your sword straight into the eye of the giant snake. The snake will now writhe around in agony, and you're free to run. Turn away from the snake, and run. You'll be able to hop onto a tree branch, and look up to pull yourself up into the air with the Shinobi Prosthetic. In midair, look ahead of you and press the left trigger again to pull yourself up to a new ledge, which leads into a tunnel. Here, the snake will try and reach you, but it fails, withdrawing. 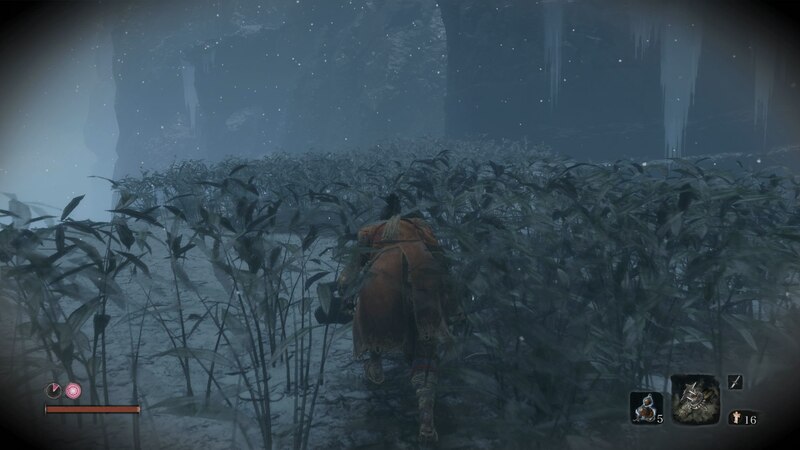 This is the conclusion of the fight with the giant snake in Sekiro: Shadows Die Twice.